The space age was well underway in 1963, and the science of astronomy was growing by leaps and bounds. Rapid advances were being made in radio astronomy, and the brand new field of X-ray astronomy opened up an entirely new window on the universe. One of the great discoveries of 1963 was the possibility that the Quasi-stellar Radio Sources, dubbed quasars, were extragalactic objects at great distances, emitting incredible amounts of energy from half-way across the universe. A flurry of papers in Nature magazine in early 1963 utilized a chance lunar occultation of a quasi-stellar radio source located in Virgo, 3C 273, to precisely determine the optical counterpart of the bright radio source. They measured the redshift -- the shift in wavelength of the observed spectrum caused by the expansion of the universe -- and found 3C 273 had a staggering redshift of 0.158, placing it nearly two billion light years distant. But more exciting news was still to come. Harlan J. Smith, who, with Dorrit Hoffleit, used the Harvard Plate Stacks to investigate the historical behavior of 3C 273. (Credit: Ohio County Public Library, Wheeling, WV). 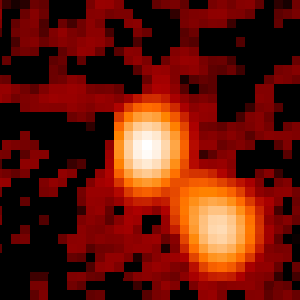 Two papers appeared shortly after the Nature series indicating that this distant, bright object was actually variable on detectable timescales. Sharov & Efremov (1963; IBVS #23) checked a small number of photographic plates held by the Sternberg Institute in the Soviet Union, and noted the object was variable, possibly on months-long timescales. For an object as bright as an entire galaxy to vary on such short timescales was unthinkable at the time, and the mystery surrounding these objects deepened. At about the same time, Harlan J. Smith and the AAVSO's own Dorrit Hoffleit used the much larger collection of photographic plates held by the Harvard College Observatory to measure the light curve of this object over the preceeding 80 years. Their light curve, published in Nature, was similarly astounding. Not only were there variations with years-long timescales, but Smith and Hoffleit also detected flares of several tenths of a magnitude, lasting months or less. Clearly, whatever the energy source was, it was small -- less than a few light-months at least! Subsequent observations of these objects and many more have revealed much about the quasars and other types of active galactic nuclei (AGN) we now know grace our universe. 3C 273's "enormous" redshift is now considered mundane among the high-redshift galaxies (which now extend to redshifts of 6 and beyond), but 3C 273 still has the record as the brightest quasar in Earth's skies. 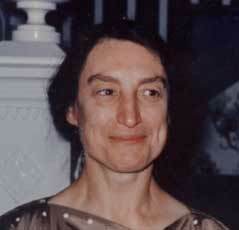 It has a special place among variable "star" observers, too. 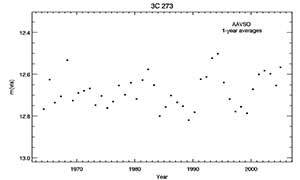 The observers of the American Association of Variable Star Observers have been monitoring 3C 273 since the mid-1960's, and your work has provided a clear record of this object's fascinating behavior over the past 40 years. 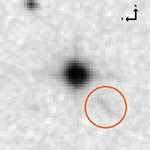 The quasars, like all active galactic nuclei, are now believed to be manifestations of supermassive black holes at the centers of distant galaxies. These black holes, some with more than a billion (109) solar masses, lurk at the centers of their host galaxies' gravitational potential wells. Their accretion disks, composed of interstellar gas, dust, and even whole stars, are heated to very high energies and radiate from the radio to the X-ray. Close to the black hole, things get even busier. 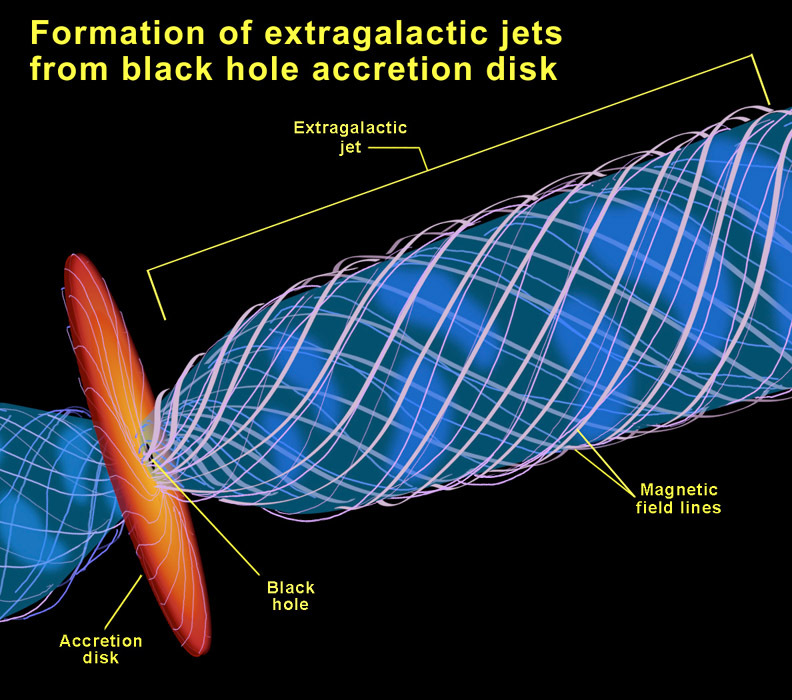 The central engines of AGN can form collimated jets of material, in which particles are accelerated to nearly the speed of light, probably by the magnetic field of the black hole itself. These particles -- electrons, protons, and heavier atomic nuclei -- encounter the galactic and extragalactic magnetic fields and the interstellar and intergalactic media, and can produce radiation at nearly all wavelengths of light. Some of the radiation is synchrotron emission, generated by ultra-relativistic electrons when they spiral around the magnetic field lines they encounter. Synchrotron emission is responsible for the radio emission in these objects, but can generate optical -- and even X-ray -- emission in the most powerful jets. High-energy X-rays and even gamma-rays are generated in jets, too, through a two-step process called synchrotron-self Compton emission. In this process, lower energy synchrotron light emitted by the jets is inverse Compton scattered by the same beam of relativistic electrons that created them. When this happens, the photons get a huge energy boost at the expense of the electrons, creating X-rays and gamma-rays. We can often see radio jets in AGN even if they are not aligned with our line of sight, but normally, in order to detect the highest-energy X-rays and gamma-rays, we have to be looking "straight down the barrel" of the jet. Many of the spectral and behavioral properties of AGN and quasars depend upon what orientation we're viewing the central engine and jet (if any) from. It is believed that AGN will be brighter the more closely the jet is pointed in our direction, and that the quasars are viewed almost straight on. In cases where the jet is almost exactly aligned with our line of sight, we see the most extreme example of AGN -- a blazar. Blazars (the name is a combination of BL Lac object and quasar) are known for their gamma-ray emission, for their mostly featureless optical spectra, and for their rapid optical variability. 3C 273 was the first quasar to be observed in gamma-rays (in 1976, by the European COS-B satellite), even though the jets aren't quite perfectly aligned with us. 3C 273 is considered a member of the blazar family because of its gamma-ray emission and its variability. But it also has some spectral line features including emission lines of hydrogen in the optical, and iron lines in the X-ray. 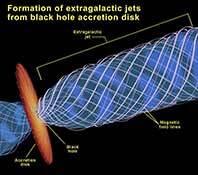 The light from 3C 273 is likely a combination of radiation from the accretion disk and from the bright jet. In many cases, we see jets from quasars and other AGN manifested as bright, extended radio galaxies, with fluffy lobes of radio emission billowing out to either side of the central engine. These radio jets and lobes can sometimes extend for hundreds of kiloparsecs away from the central galaxy. In most AGN, we only see these jets in radio light, but in principle, jets can generate synchrotron emission at any wavelength, so long as the particles accelerated by the jet have high enough energies -- the higher the energy of the electrons, the higher the energy of the photons you can get out. In a few particularly energetic systems, we can see the jets emitted by the black hole at nearly every wavelength we look in. 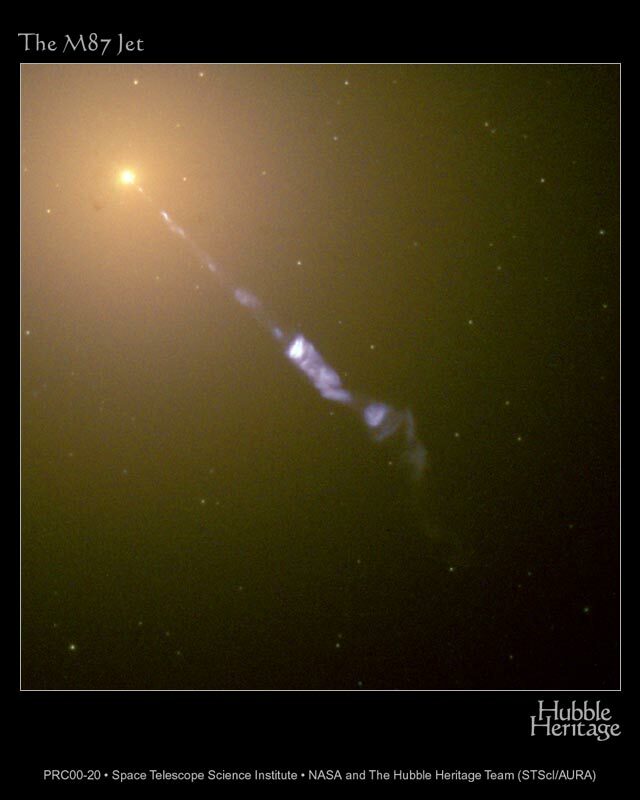 One famous example is the jet of the giant elliptical galaxy Virgo A, or M 87. The small optical jet near the core of this galaxy was detected in the early 20th century, and now radio and X-ray observations of this active galaxy show the jet is present at those wavelengths as well. Another notable example of this is our Variable "Star" of the Season, 3C 273. Bev Oke and Maarten Schmidt (1963; AJ 68, 288) noted the existence of "an adjacent thin wisp or jet". You can faintly see it in Digital Sky Survey images of this quasar, pointed directly away from the central source to the southwest. The jet is perfectly aligned with the radio jet of 3C 273, and is believed to be synchrotron emission from the same source. The high-energy radiation comes mostly from knots in the jet, where the jet undergoes shocks as it runs into gas surrounding the central engine. The quasar 3C 273 is a point source around magnitude 12.7 in the constellation Virgo (J2000 RA:12 29 06.7, Dec:+02 03 08.6), and AAVSO charts are available here. 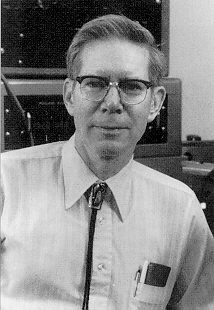 AAVSO observer Thomas Cragg (CR) made the first visual observation of 3C 273 on February 9, 1964 (mvis=12.9), and many others in the AAVSO community have enthusiastically followed this source over the last 40 years. The long-term light curve of 3C 273 has helped quasar theorists understand the behavior of these objects, and we urgently want the visual community to keep up the good work! As with many astronomical objects, the light curves of quasars become more and more valuable the longer they get, and your visual observations have made an important contribution to the science of these exciting objects. We've included the visual light curve, averaged over 1-year intervals for clarity, showing 3C 273's behavior over the past 40 years. The quasar varies by a few tenths of a magnitude over its range, and these variations occur on a minimum of year-long timescales. 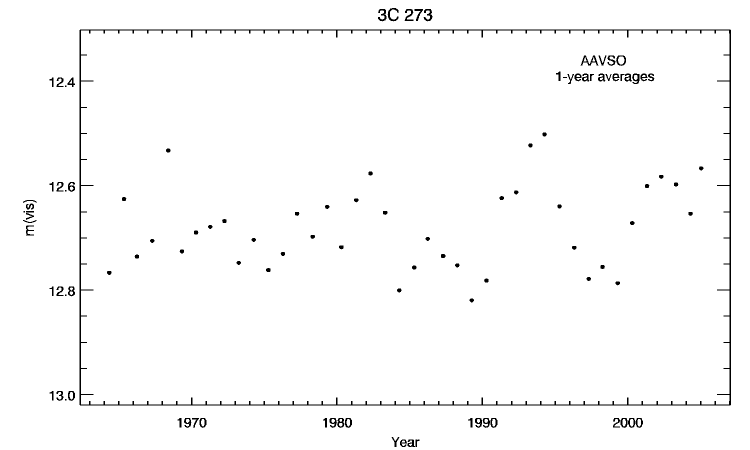 Previous work, including that of Smith and Hoffleit, showed that variations may even occur on timescales of months; the visual light curve of the AAVSO hints at these variations because of the occasionally large year-to-year changes that may have shorter-timescale structure. The maximum size of the varying region is defined as the amount of time it takes for light to travel during the course of the variation -- in this case, a few light months at most. This shows that the central engine of 3C 273 (and indeed all quasars) is small, much less than one parsec in diameter. One-year averages of 3C 273 visual observations from the AAVSO International Database. Variations in 3C 273 occur on timescales shorter than one year. Copyright 2005, AAVSO. Our Variable Star of the Season also makes an interesting target for the AAVSO's growing community of spectroscopists. Like all quasars, 3C 273 has a relatively flat continuum, indicating the high temperature of the continuum source. Also like most quasars (but unlike many blazars!) 3C 273 has emission lines in its spectrum, the brightest of which are the Balmer lines of hydrogen; the rest frame wavelengths of H-α and H-β are 6563Å and 4862Å. With a medium resolution spectrograph, one can easily spot these two features. Some of the broadness of the H-α line comes from the blend of nitrogen forbidden lines, but in general, broad lines are caused by the rapid rotation of the accretion disk around the central black hole. where λ and λ0 are the measured and rest frame wavelengths of an observed line in the spectrum. If you can take a spectrum of 3C 273, try measuring the positions of the lines yourself. What redshift do you obtain? Like in visual observing, try to measure what you see, not what you "know" the right answer to be! Finally, the AAVSO would also like our CCD observers to participate in observations of the brightest quasar in our skies as well! 3C 273 is a part of the Global Telescope Network (GTN) Blazar monitoring program, and the GTN observing community has done a wonderful job monitoring other blazars in the program, including BL Lac, Markarian 421, and Markarian 501. A CCD chart for 3C 273 is available here, and we'd love to have CCD observers making observations, be they monthly, weekly, or even daily! As with the other blazars in the GTN program, time-series observations at least one night per month are encouraged, along with the use of V and/or IC filters. Although many years of photometry have yet to reveal rapid variations in 3C 273 like those seen in the true blazars, this object has shown a few hints of flaring behavior over the years, and perhaps you could be the one to catch the onset of such an event! 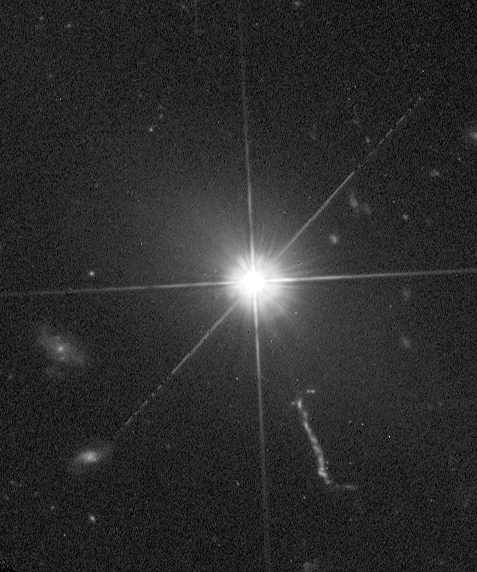 Our Variable "Star" of the season -- the quasar 3C 273 in Virgo -- offers something for our entire observing community, visual and CCD, northern and southern. The brightest quasar in Earth's skies gives you the opportunity to look far across the universe and back in time, and view one of the most energetic classes of object in our universe. An Amateur Survey With Professional Results (pdf file) by Aaron Price (AAVSO) et al. This Spring's Variable Star Of The Season was prepared by Dr. Matthew Templeton, AAVSO.